Tybee Island in Georgia has so many colorful little houses that I love looking through the listings for that area. Here’s one that charmed me as I was scrolling through the vacation rentals today. 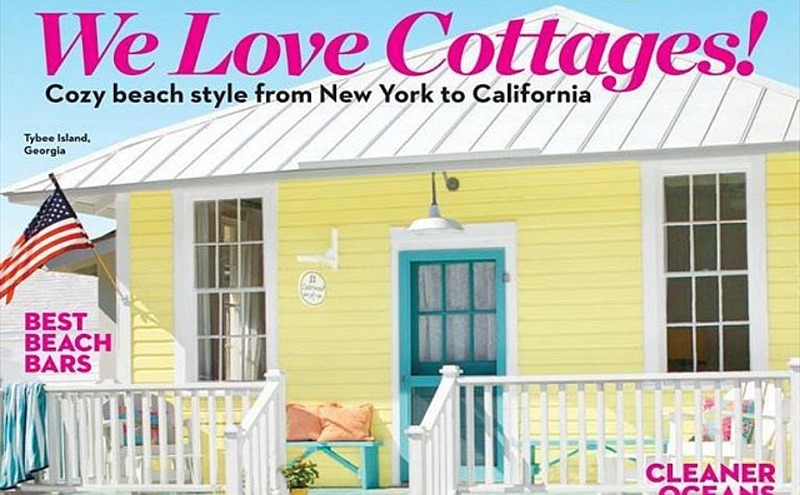 It’s a colorful beach house rental called “Cottage on the Green” that that was decorated by Jane Coslick. 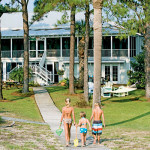 It was featured on the cover of Coastal Living magazine. Take a look! The house originally served as soldiers’ quarters during the Spanish-American War. But I have a feeling it wasn’t as colorful — or as comfortable — back then! It was decorated by Jane Coslick, who has a knack for mixing new and vintage, and who never shies away from bright color. She’s transformed so many beach cottages that she should be called the Cottage Whisperer. The cottage features original art from local artists. The Jenny Lind beds in “azure” are from Land of Nod. How fun are they? This is only one side of the charming two-unit vacation rental. For more photos and information, visit HomeAway. Also be sure to check out designer Jane Coslick’s blog where she talks about the projects she’s currently working on. It is my dream to live there one day 🙂 I am OBSESSED with Jane and her cottages- I’m on that site way too often as well! Glad I’m not the only one! Ha. How funny!! I am CONSTANTLY stalking Tybee Island! It is our VERY favorite place to vacation and where we hope to retire!!! I am SO glad I’m not the only one who does this. LOL!!! I have stayed at several of Jane’s cottages… and they look exactly like the photos! I love Tybee and I hope to some how, some day make myself a permanent part of the community! I am so glad that I can get from the upstate of SC down there several times a year. Oh, this one is perfect, Julia! What a dream!!! There’s only one thing missing there: MYSELF!!! 🙂 I really love this place! This is such a cute little cottage! I love the white with the bright accent colors! Thank you for the tour, I really enjoyed it! Adorable! Perfect for a rental. I want that kitchen sink. I want it bad. I’ll take the cute little fabric skirt in the cabinet below, too. I thought the same thing! I’m a sucker for farmhouse sinks. We loved Tybee Island when we visited in late May. We actually booked through Mermaid Cottages and stayed at “Fishtail Cottage” which is one of the cottages that Jane revamped and decorated. It has been featured in several magazines and books. We rode bikes all around the island taking pictures of some of our favorite cottages. Wish we would have been there for the Island House Tour. Adorable! And oh so sweet! Love those Tybee Island cuties! I’ve spent too much time on Mermaid Cottages too 🙂 It’s a given that eventually we’ll make our way down there too. Love the colors – gives it such a happy vibe! What a darling cottage! Putting this on my bucket! We have also had the pleasure of using Mermaid Cottages on Tybee for the last two years. We stay at “Crabby Joe’s” and we love it. Our daughter is a student at Savannah Colllege of Art and Design, alas it is her final year so this may have to go on the back burner for a while. This cottage featured is adorable. I can highly recommend Tybee/Savannah as a vacation destination and also Mermaid Cottages! so cute!! i never get tired of seeing these cottages. Thanks so much for the great and kind post . I love this cottage . I love being called the cottage wisperer…love love love. May I quote you . You re a wonderful writer!!! This is my cottage and I’m so happy to see it posted on your website. Jane was so wonderful to work with and is the most creative person I’ve ever met. I am so happy with everything she did it was so much fun! Thanks again for showcasing my little duplex cottage. Nice to hear from you, Evelyn! I love your charming cottage. What a charming place. I love the bright colors. They make the cottage look nice and cheery. The vintage black wicker settee purchased at my shop online, is soo lovely in Evelyn’s kitchen. Jane you do beautiful work!! I think I need to move there. A sleeping porch is just such a romantic idea. I love it! I need a trip there. I am also enchanted with these colorful cottages and have done a few on the blog too. I haven’t seen any other rentals that beckons one to stay there on vacation as much as these Mermaid cottages do. Here’s to Tybee! That is so cute I just can’t STAND it! I love small spaces bathed in light. I don’t want to rent, I want to stay permanently. This is so pretty. Hi Julia thank you for sharing this happy place. Regards Esther from Sydney. Long time visitor and fan of tybee and mermaid cottages! In a way I hate to say it bc shhhhhh… It’s a secret! Word is getting out about this wonderful place , hopefully it keeps its not too touristy laid back charm! Just the way we true beach goers like it! I love cottages, but why so many not for sale? I’m at a point in my life I need a home and not a temporary abode..Even a cottage, cabin or bungalow with a small to medium sized barn would be good..Surely somewhere there’s a soul home for me in this large world..tired of city noises and noisy neighbors, time for some quiet so I cam work in peace.. Such pretty rooms in an adorable cottage! I have never been to Tybee but would love to go! If I had a house like that, I would definitely do all those bright colors – so great for the beach! Love this cottage and Jane Costlick’s style. I recognized it right away. I’ve been to Tybee Island twice and finally stayed on the Island last March. We stayed at the Beach-view Inn. Tybee is a small cozy and charming island. I hope it stays this way for many years. The millionaires are beginning to move in and build their huge mansions which will raise taxes and make the island not affordable to those that currently live there. It’s becoming even more popular with all the magazine features and mentions on blogs. Let’s hope it will remain charming for years to come. It reminds me of a beach town from the 1960’s.